Let's get one thing straight: I don't diet! But a bit of August-weddings, a bit of September-birthdays, a bit of October-travelling all piled up and I felt like giving my system a break! I opted for "My Detox Diet", with the Juice-till-dinner option. I picked it because it allows you to have dinner, so it doesn't really feel like detoxing - within reason off course, provided you don't go out for a roast every evening! They have a great "before-9am" delivery service, so that you get to start day one with a lovely alkaline booster...you are not thinking "yummy", are you? OK, think grapefruit and pears then! 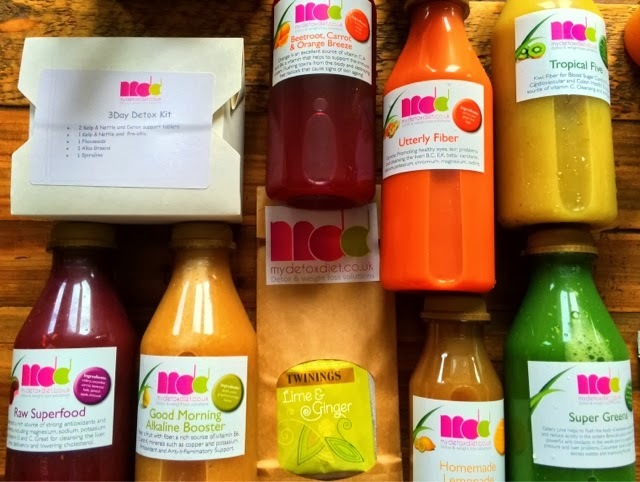 You receive a fridge-like box filled with colourful juice bottles and a handwritten envelope addressed to you, with your daily plans included; it's a nice touch! "No Sweets" or actual food were not a problem for me, but "no salt" was; lunchtime was time for a broccoli, celery, cucumber concoction and although my skin was rejoicing just at the sound of these super charged anti-oxidants, my brain was missing the salt that comes with chewy food. That was before I had to drink the whole thing. I'm afraid to say that after having had about 500ml of the green monster I didn't actually feel like drinking anything else till dinner. It sounds childish, I know, but it's all part of the tricks that your mind plays when you know you are not allowed something! Beetroot-carrot drink in the name of "Raw superfood" came at a good time in the afternoon and since it contains natural sweeteners it's the midday booster your body needs. However the mind plays tricks (again) and despite its' deep red colour it doesn't taste like strawberries nor cherries...off course not, it's beetroot! You normally laugh it off when they tell you that coffee is addictive but here we are, second day of detox and I went straight for the coffee, only I took a detour and ended up with Utterly Fibre! Carrot, ginger and pear in other words - not great for breakfast I'm afraid! But then came the organic lemonade; regardless of the fact that there were no lemons involved, it was a great spicy orange and cayenne pepper afternoon pick-me-up. I think this is the best-tasting morning drink of the whole lot! Maybe this Strawberry and oats smoothie is an attempt for positive reinforcement for making it to day three. It worked for me! What a lovely drink to start your day with. It's very filling so no naughty coffee thoughts till lunch. 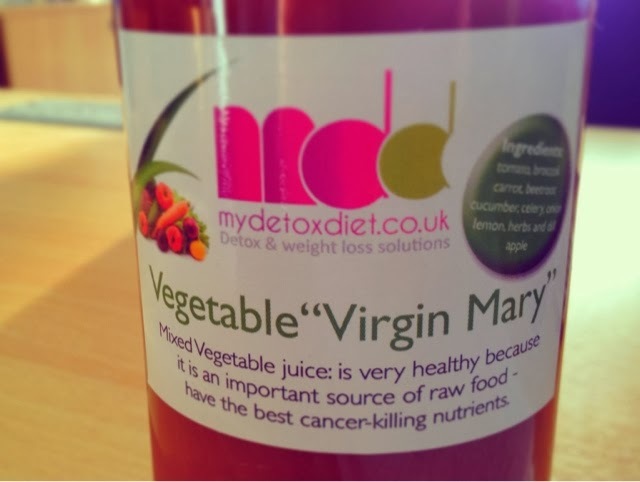 And to top it all off, the Virgin Mary comes to close your three day juice routine. I normally don't like Bloody Marys even when Tabasco and alcohol are involved so you can imagine how I felt about the virgin version. Three days later I can tell you that I am not entirely convinced that surviving on juice is natural. However, for a short period, your whole system can do with a break to cleanse and start absorbing nutrients more efficiently. On the upside you end up almost a kilo lighter but the best feeling for me was no bloating or sluggishness during the day, when you need to get on with work. For it or against it - what do you think?